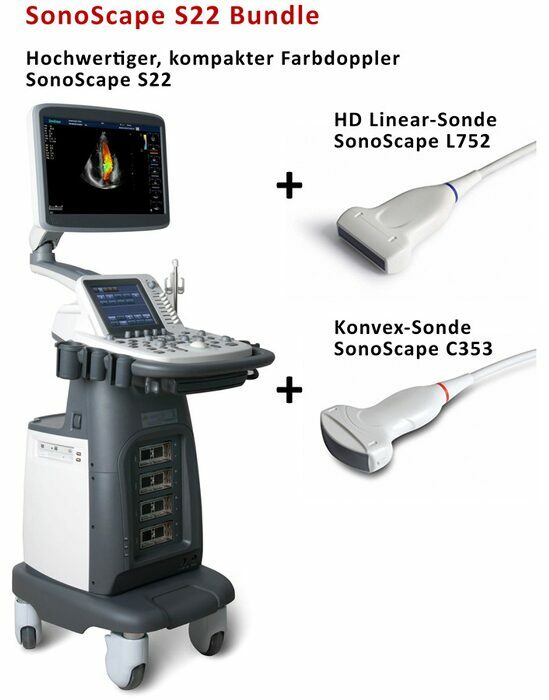 SonoScape S22 bundle including two high-value probes Color doppler trolley system with 19" monitor and 4 transducer sockets. 64 phys. channels, compatible to HD probes, flexible monitor arm. Including HD linear probe L752 and high-value convex probe C353. The S22 brings advanced ergonomics, technology, and a full suite of applications into a price-range that won't break your budget. The elegant S22 is specially designed for all modalities, including radiology, cardiovascular, OB/GYN, vascular, MSK, small parts, and more. This system is featured with a smart touchscreen, high-end imaging technologies, and an efficient workflow. Thanks to our innovative technologies, such as Multi-beam processing and μ-scan speckle reduction, clinicians will be confident for even toughest patients. *Hint: The "online ruler" (symbol "Measure" within the menu bar of FSI Viewer) is calibrated on the vertical measures and should be used for orientation only to get a feeling for proportions. Using the online ruler for warped image areas could lead to faulty dimensions which will be shown too short as a general rule. Please refer to the exact data of the technical specification or contact our service team.